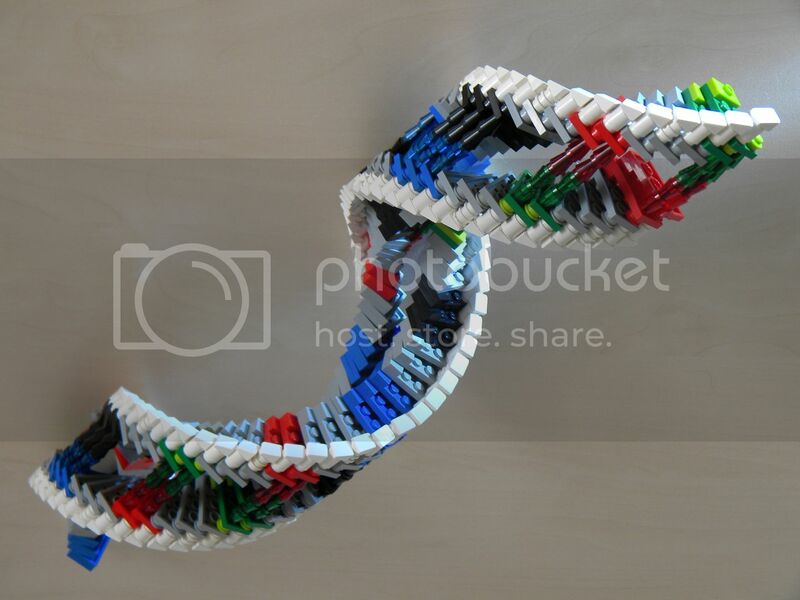 A DNA molecule was something I wanted to build for a long time... Hooray its discovery 60 years ago! The color coding of the nucleotides is that as in conventional sequencing data. Adenine, (A), Cytosine (C), Guanine (G) and Thymine (T) stringed together in the double helical DNA molecule is the genetic code of all organisms. It is the building instruction for Life! Adenine bases pair with Thymine bases. Cytosine bases pair with Guanine bases. Strings of these in the proper order, codes for everything that makes up, for example, You! How to build the pigments that give color to your eyes, where in your body to produce it, how much to make of it, etcetera. The discovery of DNA opened up the doors to the discoveries of our innermost workings! On 25 April in 1953, James D. Watson and Francis Crick published in the scientific journal Nature, the article "Molecular Structure of Nucleic Acids: A Structure for Deoxyribose Nucleic Acid". erg knap gedaan! ik zou zelf nooit op het idee komen om dat te bouwen! 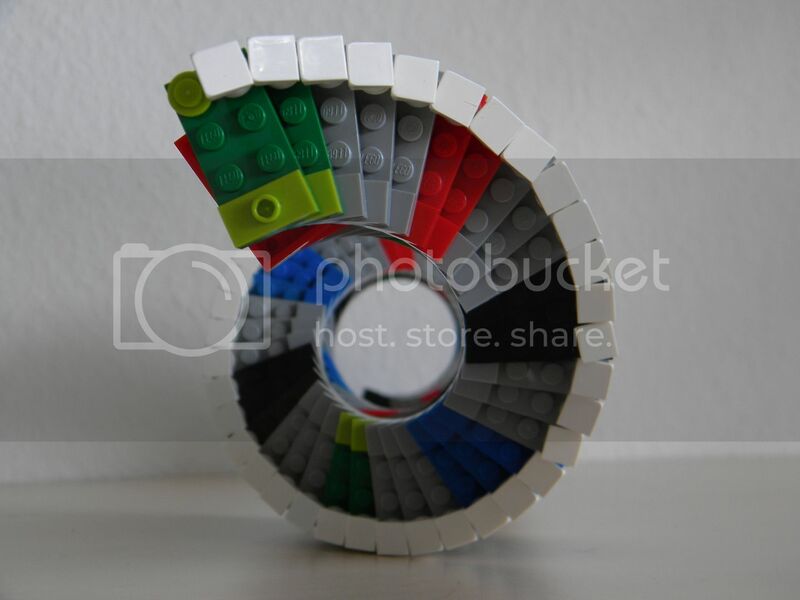 The curves that you made from square Lego bricks are brilliant. I like the colour co-ordination that goes with the description too. Clever build, respect for your patience assembling that! This reminds me of how I love biology. Great job! Hi Matt, this design started out pretty sturdy, but after 20 plates (half a wind) it becomes troublesome. A full circle of 40 is only stable as double stranded; the basepairing stabilises the molecule (just as in molecular biology!). The thing is, it doesn't actually fit... The tension just builds up with every added plate - sheer bloody mindedness is what keeps it together. Whoa! I knew what DNA looked like but I didn't know what my DNA looked like. Ah, Francis Prick... smart man, but it's a pain to read his papers. Nice job! Excellent use of colour to denote the different types of bases!